The Bearhaven copper mines, located to the west of Knockoura on the low but rugged hills above Allihies, were run by the Puxley family of Dunboy. Daphne du Maurier relocated them on Hungry Hill for her novel of the same name. Knockoura is the highest hill in the Slieve Miskish area and the 595th highest in Ireland. The old copper mining village of Allihies lies below a line of intimidating hills running E towards Knockoura. Huge shelves of bare rock thrust skyward as if the very bones of the earth had erupted through the crust here. 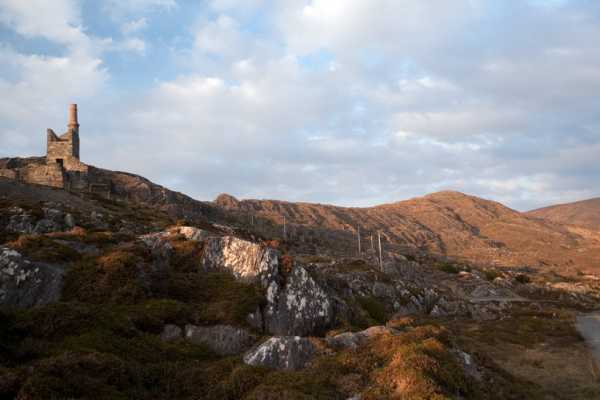 It’s possible to drive up a road leading to the nearby hill of Knockgour with its prominent masts and then walk along the plateau to Knockoura’s summit to avoid an upward roller coaster ridge walk, but adventurous hillwalkers will enjoy the challenge of the ridge. We parked at V58865 45837 A and progressed uphill towards the engine house of Mountain Mine that stands sentinel over Allihies where it has bravely faced the brunt of every Atlantic gale since 1862. Restored in 2004, this building housed a Cornish-design steam engine that powered apparatus to convey men up and down the mine. Fenced off areas prevent visitors from being precipitated down deep dark shafts and narrow voids to a watery underworld, the scars bearing witness to man’s exploitation of mother earth. Continuing uphill in a NE direction passing by a large embankment that forms the retaining wall of a reservoir for the steam engines, we picked up the metalled road that leads over the mountains, part of the Beara Way. At the top of the col we left the road and turned east, carefully picking our way along the margins of a bog, startling two hares that bounded off into the distance. Traversing the great ribs of rock upwards towards the ridge, each with their deep carpet of bog between, involved some easy scrambling. Once on the ridge the route is easier and eventually descends onto a long, boggy plateau below the slope of Knockoura with its eroded peat hags. A simple climb leads up to the summit. The views are spectacular, marred only by the masts on nearby Knockgour that actually looks higher. East, the Slieve Miskish Mountains march off toward rocky giant, Hungry Hill; SE, Bear Island, Castletownbeare, and just visible to the SW of the port, the newly renovated Dunboy Castle, former home of the Puxleys who owned the Allihies Copper Mines; W the wild and ragged line of coast leading to Dursey Island; N, the inky pimples of mountains on the Iveragh Peninsula.